Naletale Cluster of Dzimbabwes is part of the Tentative list of Zimbabwe in order to qualify for inclusion in the World Heritage List. So there I was, updating my T List count on this Web site and, at the end, just above the “Send” button, were 2 T List sites under Z for “Zimbabwe” – including “Naletale Cluster of Dzimbabwes”. But I never knew that it was on Zimbabwe’s T List? Indeed - it was added less than a month ago on 27 Nov 2018 …….. AND we had visited way back in 1997. So impressed were we with the site, that we have since then, if discussing aspects of travelling in Zimbabwe with someone, always recommended taking it in (as well, of course, as Gt Zimbabwe itself)! The, already inscribed, Khami was included in the list of recommended sites close to Bulawayo but the guidebook went on to state “The most interesting of all the Zimbabwes, Naletale, stands at the top of a natural granite dome….it’s difficult to imagine a better prospect… the site is small in size - you could do a circuit of the whole place in 15 minutes, but it is easy to while away half a day wandering about”. 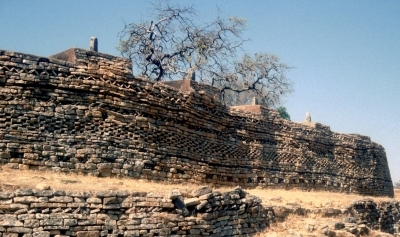 The guide book also mentioned another nearby walled location titled Danangombe (Dhlodhlo) – but none of the other 5 mentioned as making up the “cluster” in the UNESCO T List description - Nsalansala, Shangangwe, Bhila, Gwenaguru and Arupanga. No doubt some future WHS traveller will report on them – but I wouldn’t miss Naletale to do so. There is just one potential issue – I remember no problems in reaching and seeing the ruins during a 1 day c480km drive from Bulawayo to Harare in our saloon rent-a-car – but they do lie c25kms off the main road along a dirt track and at least one Tripadvisor review suggests that a hi clearance vehicle could be needed at some times of year. And what are the chances of Zimbabwe being able to bring this T List site forward to nomination? It isn’t always the case that placement on the T List indicates “action”! I have found this article from a Zimbabwe newspaper dated Nov 2013 (5 years ago) about a grant of $64,000 from USA to “restore the collapsed walls of Naletale”. I remember the walls being in pretty good condition (as per the photo - though I note in recent photos that the tree has disappeared and was perhaps damaging them). Note how the article states (incorrectly!) "The Naletale National Monument was placed on UNESCO's 2012 World Monument's Watch List". In fact, of course, the WMF which operates the "Watch List" is a US based "private, international, non-profit organization dedicated to the preservation of historic architecture and cultural heritage sites around the world" which cooperates with, but is totally separate from UNESCO. Here is its Web page for Its (earlier and separate from the US Ambassador's fund) Naletale project In May 2015, less than 2 years later, the US reported completion of the restoration. It has then taken another 3 years to get them onto the T List – I wonder how “functional” the relevant Zimbabwe governmental institutions are now after the removal of Mugabe……?